Last year, “The Trial Before Christmas” was a surprise holiday spectacle that gained national media attention and attracted more than 500 spectators to the Rensselaer County Courthouse – a standing-room-only crowd. But the jury was unable to reach a verdict, so the case will be heard again. “Account of a Visit from St. Nicholas” a.k.a. “‘Twas the Night Before Christmas,” was published anonymously for the first time ever in Troy, N.Y. by the Sentinel newspaper on December 23, 1823. And for nearly as long, two New York families have argued over who the poem’s true author was. Years after its publication, in 1837, a wealthy Manhattan biblical scholar named Clement Clarke Moore claimed authorship and has been officially credited ever since. But descendants of Henry Livingston Jr., a gentleman farmer of the Hudson Valley, claim he was the true, unrecognized author. 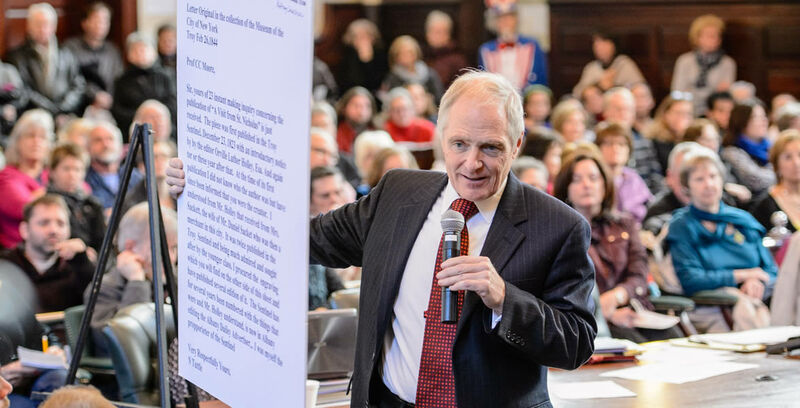 Backing their assertions is Vassar College professor and literary forensics expert Don Foster, whose 2000 book “Author Unknown” presented a strong case for Livingston. On the other hand, Dr. Joe Nickell thoroughly refuted those claims in his book “Pen, Ink and Evidence,” also published in 2000. Both works and other research serve as inspiration for the upcoming courtroom showdown. Representing Moore is Upstate New York’s preeminent litigator, E. Stewart Jones, Jr. On the side of Livingston will be Troy novelist and attorney Jack Casey, author of “The Trial of Bat Shea,” and his daughter, attorney Molly Casey of Albany law firm Thuillez, Ford, Gold, Butler & Monroe. A third-generation lawyer, Jones heads the E. Stewart Jones Law Firm established in Troy in 1898 by his grandfather, Abbott Jones. The trial’s ornate setting will be The John T. Casey Ceremonial Court, named for Jack Casey’s father who served there as State Supreme Court Justice. Retired New York State Supreme Court Justice Edward O. Spain will hear the trial to settle the contested authorship. Real court officers, a court clerk and a court stenographer will give mock trial goers an authentic experience. But the spirit will be fun and lively, Crary said, noting that a saxophone playing Santa Claus, elf and special guest will entertain the audience during a brief jury deliberation. Last year on Wed., December 18, the Jones and Casey legal teams argued passionately on behalf of their “clients,” descendants of Clement C. Moore and Henry Livingston Jr. But a jury of six with one alternate — selected from the audience — was unable to reach a verdict. This year, the case will be re-tried with the original legal teams reprising their roles during Troy’s 32nd Annual Victorian Stroll, a city-wide holiday festival that attracts more than 20,000 visitors. Jones, however, remains confident the jury will agree with the long-accepted authorship credit to Clement Clarke Moore. Last year, Jones played up the case mostly for laughs. And laughs there were many. Casey, who also caused some riotous chuckles from the crowd, said he probably takes the arguments more seriously as he’s representing the underdog. “The people of Troy root for the underdog,” Casey said. Famous Canadian anti-smoking advocate Pamela McColl will take the stand this year, to give expert testimony regarding the inclusion of a smoking Santa and how it reflects upon the views of the contesting authorship claims. In 2012, McColl published a version of “Account of a Visit From Saint Nicholas” that removed all lines referring to the “jolly old elf” smoking. Her best-selling book, titled “Twas The Night Before Christmas, edited by Santa Claus for the Benefit of Children of the 21st century” (Grafton and Scratch Publishers), was the winner of four IBPA 2013 Benjamin Franklin Awards: including first place best cover, Moonbeam Children’s Book Awards 2012; Gold Medal best holiday book; first place at the Global International Ebook Awards best Christian children’s title; and gold place for the Mom’s Choice Awards in 2013. McColl’s smoke-free edits to the classic poem captured international media attention including the Associated Press, NBC Nightly News, The Colbert Report, The View, the BBC and National Public Radio. McColl will selling and signing books at The Book Outlet in downtown Troy’s Uncle Sam Atrium on Saturday, Dec. 6 (Saint Nicholas Day) from 10 a.m. to 2 p.m. during the Troy Farmers Market. She will also sell and sign books at the post-trial reception at 4 p.m. in the Troy Public Library. Rensselaer County Historian Kathryn Sheehan will give also expert testimony. As with last year, a few ghosts from Christmases Past are also expected to take the stand. In order to accommodate overflow crowds, there will be a live simulcast on a large movie screen in the Rensselaer County courthouse rotunda. There will be a live simulcast on a big screen in the Rensselaer County Courthouse rotunda for overflow crowd. The Trial Before Christmas has reached its $2000 minimum goal on Kickstarter, however donations are still encouraged and needed and will go directly to making this production as wonderful as possible. Underwriting Sponsor of the event is Gramercy Communications, an independently-owned strategic communications agency headquartered in the historic Troy Sentinel building at 225 River Street. A bronze plaque commemorating the site where “A Visit from Saint Nicholas” was first published is affixed to the building’s exterior wall. It credits Moore as the author. Gramercy Communications previously provided a grant to fund the digitization of the Troy Sentinel’s archives, including the edition featuring the historic poem, and donated the full archives to the Troy Public Library. This year’s “Trial Before Christmas” poster features the hand-drawn illustrations of Ben Karis-Nix, of Troy Cloth and Paper. It is available for download at the link above.